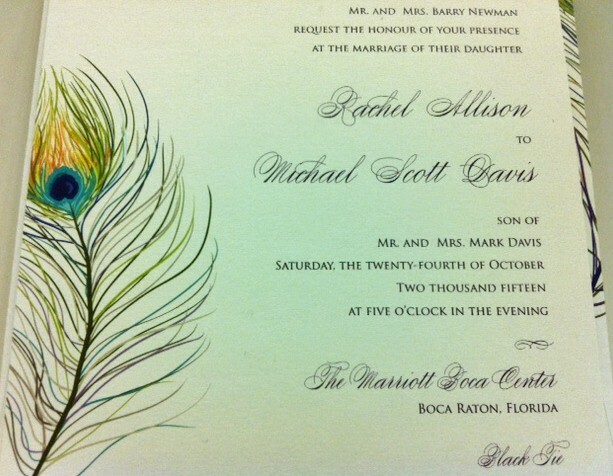 Peacock themed Invitations have been a trend for Weddings for the past few years now. So I’m finally writing about this design that has entered our wedding and party stationery realm. Whether you’re looking for romantic Save the Dates or impressive Wedding Invitations, at Hyegraph, we can help you design a unique look incorporating the Peacock Pluma Design. Save the Date with these colorful, bright, vibrant Peacock Feather Save the Dates from Checkerboard at Hyegraph! The above peacock Save the Date Card is on Aubergine stock with flat printing in gold ink found in our Unveiled Checkerboard Album. 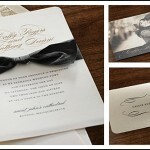 The Save the Date Invitation is a great way to introduce your friends and family to you as a couple in a formal way on paper also setting an expectation of the actual Wedding Date. The above peacock design is incorporated into the wedding invitation by Lemon Tree Stationery on thick whiteboard. 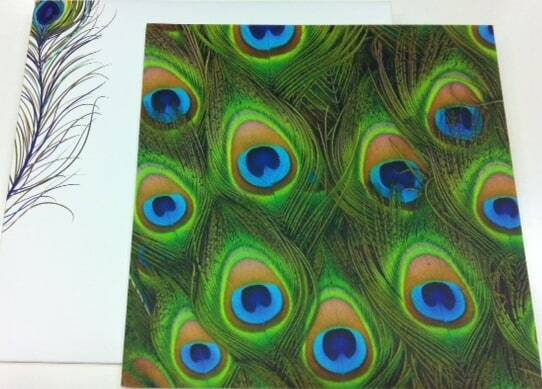 The first layer is the Peacock Feather, the second layer is the actual whiteboard and the third layer is the thermography–which is a heat seeking technique raised lettering tactile and felt by the touch-printed in violet ink matching the nuances of the violet in the peacock art work. 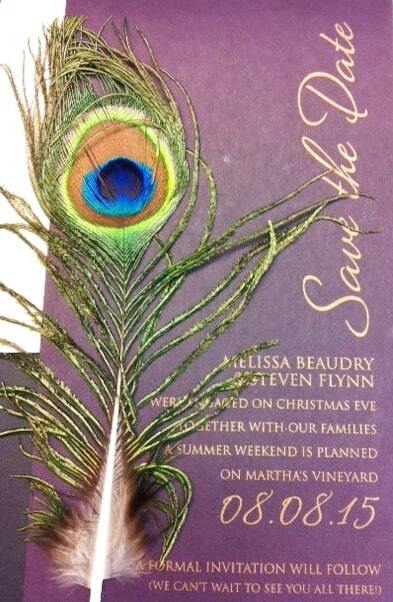 This invitation is square which also comes with a square envelope also adorned by the peacock motif. See how vibrant and life like is the back of this wedding invitation from Lemon Tree Stationery which comes with a peacock feather adorned white, square envelope as seen in the above illustration. The above photo was shot by our local, award winning blogger, Stacie Tamaki of The Flirty Blog, at the San Francisco Zoo. 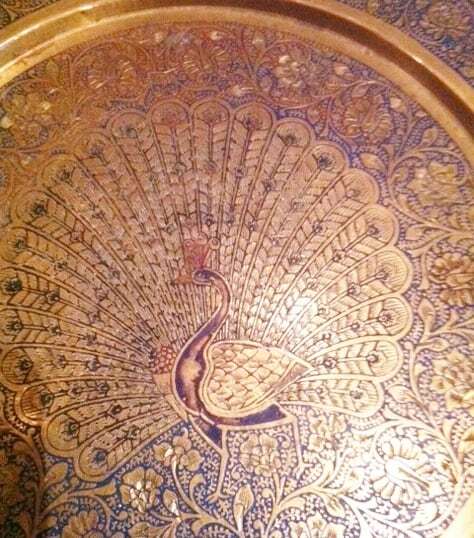 All of the above elements, be it an artwork at an Indian Restaurant, the motifs adorned on a Save the Date or Wedding Invite represent the bird, peacock, which was named as the national bird of India in the 1960s. The colorful peacock which we associate with the extended feathers is actually the male bird. 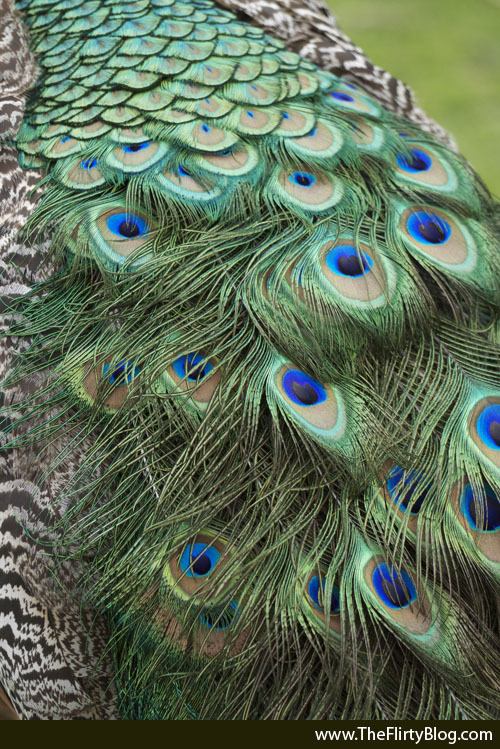 The male peacock displays his colorful, “extravagant eye-spotted tail” as a display for courtship, according to Wikipedia.com. The female bird is called a peahen and the offspring is called peachicks. I suppose it is appropriate to use this attractive symbol of mating on save the dates and wedding invitations in Indian Weddings or any other ethnic or romantic invitations. If you’re planning an extravagant event and need equally extravagant Indian Wedding Invitations, Persian Wedding Invitations or just a romantic invitation, the Peacock Invitation may be the appropriate design for you. You can see more Pluma Wedding Invitations, Indian Wedding Invitations, Mongolian Wedding Invitations or Armenian Wedding Invitations and Save the Dates on our Hyegraph Wedding Blog. For prices on wedding invitations and Save the Dates please see our ONLINE site or call, email or stop in to Hyegraph located at Three Embarcadero Center in San Francisco. 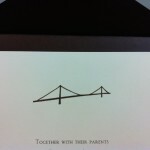 If you need help addressing the envelopes for your wedding invitations, simply see our Calligraphy Page. Happy Planning! Be like the male peacock and strike your feathers and stand tall and embrace the world.